Se incheie cu 3 mosuleti. As the brownish one. Little sweater for Barbie, Steffi Love and other chinese fashion dolls (ex. Momoko) - in the numerical order by jersey :) and of the display in this post. Made with sewing needles, of soft and thin mohair thread. It closes with 3 little hooks. Alt hanorac Tonner doll - Craiasa Zapezii. 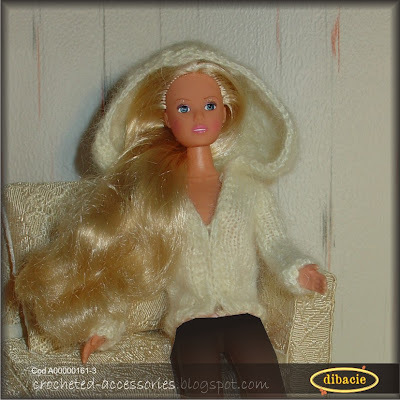 Another hoodie Tonner doll - Snow Queen.